following. We're not so puzzled. What must it be like to endure a loved child's violent death and then see the killer's face in front of you: unhindered, alive, well, thriving, a celebrity boasting to others about what a blessed thing she did? Not such a common thing of course. But in our case it doesn't take much imagination. It's part of our lives, a stressful and painful matter of our routine. The name of Ahlam Tamimi, our daughter Malki's murderer, will be familiar to people who follow our blog. Tamimi was convicted on her open confession for the central role she had in the 2001 massacre at Jerusalem's Sbarro pizzeria. She was sentenced by an Israeli judicial tribunal to 16 consecutive terms of life imprisonment. But she walked free in October 2011 - not because she was pardoned, not because she repented, not because the court changed its mind. 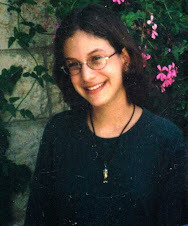 She was a beneficiary of the catastrophic Shalit Deal which brought about the unwarranted (and eventually lethal) release from Israeli top security prisons of no fewer than 1,027 Arab terrorists, the majority of whom were there for having killed or tried to kill Israelis and/or Arabs. Two days after her release, Tamimi was re-settled in her homeland, Jordan. Shortly after that, we started work on asking the US government to bring serious charges against her under its laws. Our daughter Malki was a US citizen. Early last year, a US Federal criminal complaint against Tamimi was unsealed in Washington DC ["14-Mar-17: Sbarro massacre mastermind is now formally charged and extradition is sought"]. 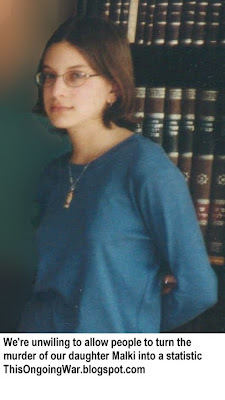 The same day, the FBI announced she was being immediately added to its Most Wanted Terrorists list, and that the US was asking the Hashemite Kingdom of Jordan to extradite her under the provisions of the Clinton-era Jordan/US Extradition Treaty of 1995. Fifteen months later, she is still on the FBI's list; the charges against her remain pending, though she needs to be in the US for the US courts to do their work; and Jordan flatly refuses to extradite her. In fact, a Jordanian court has ruled that the treaty is of no effect, and never took effect. It blamed some narrow and technical factors that the US lawyers and criminal justice officials we have consulted dismiss as nonsense and that could have been fixed, if they existed at all, by Jordan alone. Our own research has turned up at least three separate cases where Jordan did extradite its own nationals to face serious criminal charges in the US. Nonsense or not, Jordan seems to be at ease with this self-confessed mass-murderer among its citizens, living freely and unhampered in its capital, playing an active role in that country's public life. Our efforts to get Jordan's foreign minister, other vocal members of Jordan's government, and Jordan's diplomats in Washington to justify Jordan's scandalous approach have produced what we feared: silence. We have some pots on the cooker and are quietly hopeful that the day is not far off when Ahlam Tamimi appears before the US justice system and has to answer to the law. We also claim some credit for a bounty that was announced by the State Department five months ago ["31-Jan-18: There's now a $5 million reward for bringing the terrorist Ahlam Tamimi to justice"] but has not yet been awarded though there's no secret about where Tamimi and her family live. Meanwhile, Tamimi remains - as we warned she would be in the months and years leading up to her extorted freedom - a highly visible spokesperson, an idolized advocate for the Islamist brand of terrorism and for bigotry directed at Jews, a constant and persuasive pro-terror voice spreading her brand of jihad in receptive circles. (Among the scores of instances of what we said publicly back then, see "13-Oct-11: Roth explains to Australia's AM why the release of murderers is so bad [audio]"; "19-Oct-11: Haaretz: Shalit prisoner swap marks 'colossal failure' for mother of Israeli bombing victim"; "17-Nov-11: A monster walks the streets and she has many accomplices"). 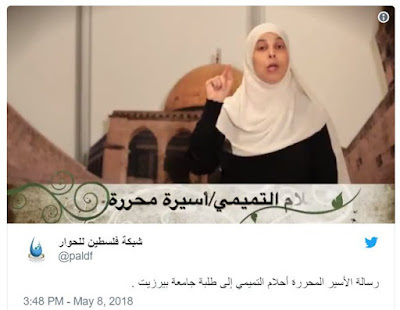 For five years, Tamimi fronted a heavily-promoted, made-in-Jordan terror-advocacy television program called “نسيم الأحرار” (transliteration: “ Nassem al-Ahrar” or “Breezes of the Free”) on one of the global Hamas TV stations. Beamed weekly by satellite and internet to large audiences, this turned her into a personality throughout the Arabic-speaking world. Tamimi is an extremist who sees herself part of a war pitting her religion against others, in particular against the Jews. Not a philosophical war or an abstract clash-of-cultures battle but an actual blood-and-guts war in which people are physically conquered and killed. You can watch her being explicit about this in a video here: "08-Oct-17: Why kill religious Jewish children? Because, says Hamas celebrity-jihadist, this is a religious struggle". As thrilling as enjoying the live presence of the woman who overcame the Zionists must have been to the ladies group, Tamimi played the central role in a significantly more impactful appearance just a few days later on May 8, 2018. That's when one of the numerous arms of Hamas - equipped for reasons that baffle us with a working Twitter presence that has attracted more than 300,000 followers - ran this video clip (Tamimi comes on after about 15 seconds). It calls our daughter's murderer "the liberated prisoner Ahlam al-Tamimi" and it captures her delivering a message to the students of Birzeit University. What began as a small girls’ school in Birzeit town has become the most prestigious Palestinian university, transforming Palestinian higher education through its impact on community awareness, culture and resistance. Birzeit University has been a thorn in the side of the occupation, insisting on playing its role of enlightenment and creating a multicultural Palestinian society on the campus grounds. Ramallah where it is located has been ruled by the Palestinian Authority since the early nineties and serves today as the de facto administrative capital of the Palestinian National Authority. Nonetheless it's only too clear what the Birzeit authorities mean by their references to "resistance" and being "a thorn in the side of the occupation". It's also clear what Tamimi, Hamas' first female jihadist, speaking via a Hamas-mouthpiece Twitter account, means when she refers to the future belong to the students and the almighty being with them and protecting them. She is an advocate for murdering Jews and Israelis. As she has said many times in public, she thinks others should do it too. When it comes to Ahlam Tamimi, this is no mere polemic. Her audience understands that she is free despite masterminding a massacre. In her customary religion-centric language, she is urging them to do the same, assuring them of the same divine protection that her life exemplifies. What sort of impact does explicit incitement of the Tamimi kind have on university students? It's a question that ought to be asked by the various foreign universities that have "international partnership" arrangements with Birzeit. As the list here on the Birzeit website show, they include campuses in Spain, Belgium, Latvia, Malta, Greece, United Kingdom (including Middlesex University, and the University of Salford), Italy, Norway, Bulgaria, Estonia, Iceland, Ireland, Austria and Germany. The Arabic version of Birzeit's Wikipedia entry lists under the heading "Students and Graduates" the names of prominent terrorists including Tamimi herself along with Yahya Ayyash, Hamas' most famous bomb-maker (now deceased) and Marwan Barghouti, serving multiple life sentences for terrorism and murder. (None of them is mentioned in the English-language Wikipedia entry for Birzeit, though it does mention that "Hanan Ashrawi taught literature there". Jordan has treaty obligations to the US and seeks - successfully so far - to avoid them in the specific case of the murderer of Jewish children and Israeli citizens even as it agrees to extradite other Jordanian felons whose victims weren't Jews or Israelis. Jordan provides a safe haven for one of the highest-profile individual propagandists for Hamas' brand of Islamist terror currently active. If Jordan respects its US ally, it ought to be acting very differently and the US ought to be letting the Jordanian regime know what is expected of it. If Tamimi is a test, up until now there can be little doubt the jihadists are ahead.